Spend the night at the ballpark, hang out at the “Hoops Hotel” or hang 10 with friends at Disney’s All Star-Sports Resort, a Walt Disney World Resort Value category property that’s a perennial favorite among traveling youth groups, as well as budget-conscious family fans. 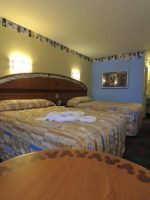 Opened in 1994 with a room renovation completed in 2008, the 1,920-room sports-themed, Animal Kingdom-area resort is convenient to the ESPN Wide World of Sports Complex and Blizzard Beach Water Park, and is the first stop in the resort bus cue among Disney’s three All-Star hotel properties. Basic, but family-friendly accommodations are located in five pairs of three-story buildings, each adorned with larger-than-life images playing homage to a range of sports, including baseball, basketball, football, surfing and tennis. From gigantic 38-foot-tall surfboards festooning the faÃ§ade of the “Surf’s Up!” block to a colossal tennis ball can (capacity: nearly 9.5 million regulation size balls! ), prominently positioned photo-ops abound. A lively arcade and two themed pools will keep the kids cool and entertained after a long day at the theme parks, and when it’s time to blow off some steam, a playground and a variety of sports “fields” provide space for active fun and games. A sports-themed food court serves up fan favorites like hot dogs, chicken wings and ice cream, and budget-friendly rates are accompanied by all of the advantages of a Walt Disney World stay, including early-entry and late-stay theme park privileges. 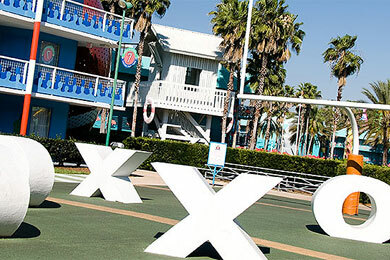 Accommodations are located in five pairs of three-story buildings, each adorned with larger-than-life images playing homage to a range of sports, including baseball, basketball, football, surfing and tennis. Standard rooms are compact (260 square feet) and basic, but smartly designed for traveling families, with child-friendly features like rounded furniture corners, plastic ice buckets and paper cups instead of the glass versions commonly provided in upper level Disney properties. Decor matches the All-Star sports theme -- headboards, wall art and linens are decorated with stars, sports equipment and game-playing Disney characters and wallpaper and border designs feature images of athletes participating in sporting events, from football to tennis. Most standard rooms contain two double beds and sleep up to four, plus one crib sleeper for guests under the age of 3. Each room contains a single vanity positioned outside the bathroom (compared to the two found in most moderate and deluxe Disney properties), a combination TV cabinet/bureau, a hair dryer, a table with chairs, an alarm clock and a wall safe. If you want a refrigerator, you can request one for a small fee per night. Coffee makers are not available. There is a small surcharge per person, per night for more than two adults in a standard room -- though honestly, more than a couple will stretch the limits physically, as well as figuratively. Connecting rooms are available. Complimentary bed rails and Pack 'N Plays are provided upon request, and high-speed Internet is free throughout the property. With regard to room location, proximity to Stadium Hall is key for traveling families, especially for those utilizing resort transportation. An extra fee per night for a preferred location will get you close to Stadium Hall, the main pool and the bus stop in the "Surfs Up!" block, while rooms in the "Touchdown!" section are almost as close and don't come with a surcharge for proximity. If you're concerned about noise, request a "quiet location" on the third floor. Quiet hours (10 p.m. to 9 a.m.) are posted throughout the resort, but some areas, by design, are less conducive to guest compliance. Thankfully for parents of stroller-age children, all buildings contain elevators. 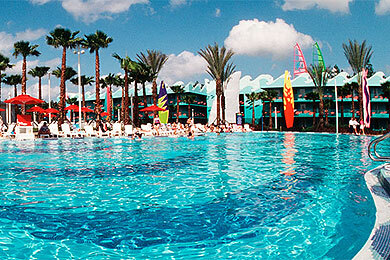 Although not as convenient to Stadium Hall, rooms in the "Home Run Hotel" are close to the All-Star Music Resort's Calypso Pool, the site of a variety of scheduled activities. 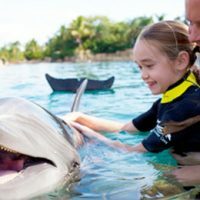 My family and I just recently went to Disney World for a week and stayed at Disney’s All-Star Resort. The food at the resort was very good. If you are on the Dining Plan I would recommend eating your quick service meals at the resort, especially for dinner. Also, if you buy the rapid refills resort mug, you get a dessert with every meal instead of a drink. The desserts were AMAZING!!! If you don’t pay extra for a close room, be prepared to walk to the food court. The resorts decor (outside) was very cool. They have a football field, very nice pools, and EVERYONE that works there is unbelievably nice, friendly, and very helpful. Our only major complaint was the outdated room. My family and I had stayed in a newer Holiday Inn Express the night before we arrived here and it was so nice. It was like staying in $1000 a night room compared to the All-Star room. The resort and the room was very clean. The resort housekeepers kept the room very clean the entire week. I just think it’s way past time for the rooms to be updated. Other than that, it was a great trip. We will probably stay at a different resort next year but anytime we go and want a budget friendly room we will continue to stay at Disney’s All-Star Resort! All in all, I had a good time with my son here. We just wanted a short vaca from home, with no worries, in a resort atmosphere. The pool was large. They had enough of a cafeteria with good variety. Rooms were pretty small, but large enough for the two of us, loved the sports décor of the rooms. We had issue with our wristbands not being activated, called front desk, and they sent somebody out to fix the issue. My only let downs were 1). We had paid extra for a preferred location room... and it had a tremendous view of the back of a surfboard and the pool equipment shed (so no view), and 2). the bus stop was open air, though it would be nicer to have some kind of roof shelter from rain and direct sunlight. Would stay here again in the future. Hang 10 with friends and family at the Surfboard Bay Pool, the resort's main beach-themed pool located behind Stadium Hall and featuring more than 240,000 gallons of liquid fun. 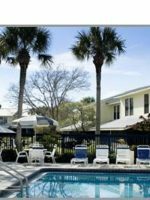 Unlike feature pools at most Deluxe resorts, as well as at the Moderate category Caribbean Beach Resort, the Surfboard Bay Pool doesn't offer zero entry, but nearby, you'll find a small kiddie pool perfectly right for little ones. Within the vicinity, there are multiple seating options, including covered patio tables and lounge chairs, all situated on an expansive deck landscaped with palm trees. At night, soak or float in the pool while watching movies under the stars at this pool. In the infield of the "Home Run Hotel" section, you'll find the smaller baseball diamond shaped Grand Slam Pool. From the center of the pool, Baseball Goofy pitches water to passing "players." At the main pool at Disney's All-Star Music Resort next door, kids and families can take part in planned activities from mid-afternoon to late night. 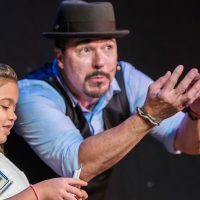 Activities range from Bingo, scavenger hunts and trivia contests to dance parties, complete with water balloon tosses and hula-hoop challenges. After sundown, G- and PG-rated movies are projected on an inflatable poolside screen. None of the All-Star resort pools offer slides -- a recreational feature exclusive to Moderate and Deluxe level Disney properties. At each pool, a restroom contains space for changing, as well as rental lockers. Life jackets are available at the arcade with a Resort ID. Towels aren't provided on the pool deck, so bring one from your room. Swim diapers are required for non-potty trained children and can be purchased at Sport Goofy Gifts and Sundries (open 8 a.m. to 11:30 p.m.), along with sunscreen, souvenirs and infant and toddler essentials. Pool hours are 8 a.m. to midnight, and lifeguard hours vary by the season. At themed sports sites, between the "Touchdown!" and "Center Court" buildings, kids can blow off some steam by punting, passing and kicking on a turf "field" (soft-soled shoes only), or else playing along in baseball and tennis games, along with Donald Duck and his nephews. Located in Stadium Hall, this family fun zone features around 80 games. Hours are 8 a.m. to 11 p.m. Between the "Surf's Up!" and "Touchdown!" sections, a playground for ages 2 to 12 contains two climb and slide structures -- one for older kids and the other designed for younger children -- plus a couple of benches for parents. There's a decent amount of shade, but slather on the sunscreen to be safe. In Stadium Hall, a Caricature Artist creates playful renditions of parents and kids enjoying their favorite sport, hobby or occupation. Choices range from black and white face portraits to full-body color pictures (fee). Hours are 6 to 11 p.m. daily. 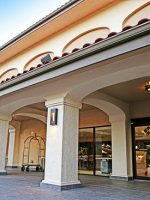 At this family-friendly food court with a sporting theme, newly renovated in 2013, four themed stations (Pizza Shop, Grill, Specialty Shop, Bakery & Ice Cream Shop) and a Grab and Go Market provide variety, as well as value. For kids, Mickey Waffles with bacon and fruit for breakfast (Specialty Shop), grilled cheese or chicken nuggets (Grill Shop) and pasta with a meatball or cheese pizza (Pizza Shop) for lunch or dinner are reliable palate pleasers, while older children, as well as adults will enjoy the chicken quesadilla platter, pasta with meatballs, create-your-own burger, pasta and salad options (the latter with a choice of protein) and home-style dinners (baked chicken, roast turkey and grilled salmon). At the Specialty Shop, featured adult dinners (served 4:30 to 10 p.m.) include baked Mahi Mahi and chicken potpie. Kids lunches and dinners (ages 9 and under) come with grapes and carrot sticks, as well as a choice of milk, bottled water or apple juice. A cookie or a soft drink may be substituted. A Grab and Go Market offers healthy snacks like fresh fruit, yogurt parfaits, and carrot and celery sticks, while Mickey bars from the freezer case, as well as a Gelato Bar and sundaes and milkshakes from the Ice Cream Shop are popular vacation treats. The Grab and Go Market even stocks a supply of special occasion cakes, convenient for impromptu celebrations. If you're dining with preschoolers, head to the back of the dining room, where you'll find a kid-sized table with chairs and coloring supplies and a TV playing cartoons. A corner art gallery displays the winning entries in a daily coloring contest. Featured artists receive a free snack item from the food court. Ample high chairs and booster seats are available; seating choices include booths, as well as tables; and covered patio seating is available outdoors. The food court itself can be very busy during peak times, particularly in the morning. Escape the crowds by arriving early, or pick up ala carte items the night before and enjoy a peaceful meal in your room. Food Court hours are 6 a.m. to midnight daily (pizza served until midnight) and specific hours vary by station. The Beverage Island is open from 6 a.m. to midnight. If you're too tired to trek to the Food Court, All-Star Pizza Delivery will deliver a variety of pizzas to your room, along with salads, sandwiches, dessert, beer, wine and soft drinks. Hours are 4 p.m. to midnight. There is a minimum food order and a delivery fee and service charge will be applied. Alternatively, you can skip the add-on charges and get a pie to go from the food court Pizza Station Pick-up Window; hours are 11 a.m. to midnight. At this spirited watering hole with windows open to the food court, as well as the area just outside the Surfboard Bay Pool, you can order beer, wine and frozen alcoholic or non-alcoholic drinks. It's open daily noon to midnight, except Sundays, when it opens at 1 p.m.
Food courts at the neighboring All-Star Music and All-Star Movies resorts offer different decor and similar menus, with some additional options. 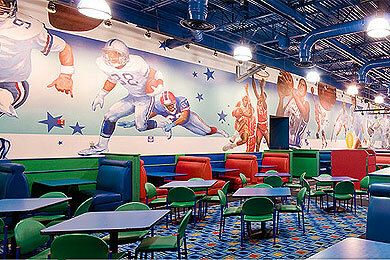 Fan favorites include cheese steak subs at World Premier Food Court at Disney's All-Star Movies Resort. Note: The Intermission Food Court at the Disney's All-Star Music Resort will be temporarily closed from August to December 2014. Tip: Purchase a refillable mug and receive unlimited hot and cold (non-alcoholic) drink refills at All-Star Resort Food Court beverage islands. If you're celebrating a special occasion like a birthday or anniversary, "Celebration" buttons are provided (with advance notice), and in Stadium Hall, miniature lockers and a photo gallery of sports greats set the scene for a sports-themed getaway. Overnight guests enjoy a number of special perks, like early-entry and late-stay theme park privileges (Extra Magic Hours), free onsite transportation, free parking and the opportunity to participate in a Disney Dining Plan with a Magic Your Way Package. Additional family-friendly privileges include online room check-in (up to 10 days in advance), resort airline check-in (a big help for families), the ability to make FASTPASS+ reservations 60 days in advance and airport transportation service via Disney's Magical Express. A paved jogging trail (approximately one mile) runs along West Buena Vista Drive, from Disney's All-Star Sports Resort to Disney's All-Star Movies Resort. Kids Nite Out, an independent agency, provides in-room resort childcare. A four-hour minimum and a $10 caregiver transportation fee are required. Fortunately for travelers on a budget, the least expensive times to visit Walt Disney World theme parks (Value Season) tend to coordinate with dates when crowds are the lightest. If your kids aren't in school yet, September is a great time to visit. 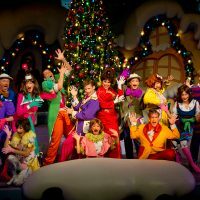 Another prime time -- early December -- as well as certain other times throughout the year when major competitions take place can be hit or miss for families at Disney's All-Star Sports Resort, due to a large influx of visiting youth groups. 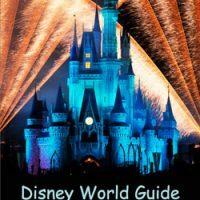 From Orlando International Airport (MCO): Free roundtrip airport transportation via motor coach is available to guests (advance reservation required; limited hours) via Disney's Magical Express. By car, take the South Exit Road from Orlando International Airport to SR 417 Toll Road (GreeneWay) West and follow signs to Walt Disney World/All-Star Sports Resort. Free transportation to and from all Walt Disney World theme parks, water parks and Downtown Disney is provided by bus. A bus stop is located just outside Stadium Hall -- the first stop for All-Star Resort guests traveling to and from the theme parks at less busy times, when buses are traditionally shared. The bus stop isn't covered, so be prepared to brave the elements. Ponchos and sunscreen are a World traveler's friends and for kids, activities, such as bubbles, will help to ease the wait. For those traveling with children under 3, a stroller is a must. 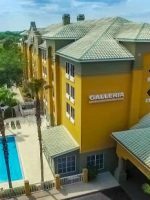 Grab a frozen drink at and soak up the team spirit in a poolside lounge chair while the kids swim, or book a babysitter and enjoy a kids-free sporting event at the nearby ESPN Wide World of Sports Complex.